“What happens in Vegas, stays in Vegas” and that includes undefeated records. 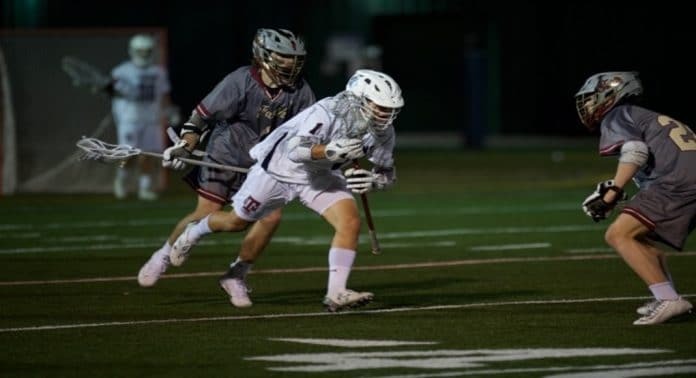 After opening the season 6-0 in its home state of Nevada, Las Vegas-based Faith Lutheran traveled out of state for the first time this season and was routed 15-5 by a red-hot St. Margaret’s boys’ lacrosse team on Friday night. A highly anticipated clash of undefeated records turned out to be a lopsided affair as St. Margaret’s dominated the Nevada state champions in nearly all aspects of the game. In particular, much of the Tartans’ success came from winning 19 out of 21 face-offs, compliments of FOGO stalwarts Stuart Pollard and Chris Totah. In the early goings, St. Margaret’s was actually playing catch-up for a little while, but a pair of goals from Andy Shin (3g, 1a) kept the score knotted at 2-2. Garrett Kuntz (4g, 1a) then snuck in a crafty finish to put the Tartans up 3-2 right before the end of the first quarter. Kuntz’s late goal gave the Tartans a huge wave of momentum going in the second quarter, which ultimately spelled curtains for the Crusaders. From that point until the final horn, St. Margaret’s went on a 12-3 run en route to its seventh win of the season. This win matched the Tartans’ largest margin of victory this year since an 18-8 dismantling of Great Oak in their season opener. The St. Margaret’s offensive onslaught was led by junior Kevin Groeninger, who tallied a season-high eight goals to go along with one assist. However, as good as the team’s offense has been all season, it was the Tartans’ defense – especially Duke Ballard – who did a remarkable job of forcing turnovers and shutting down Faith Lutheran’s top-scoring midfielder. Goalie Zane Handy also had another solid outing, coming up with eight saves and only allowing five goals, the second-lowest he’s allowed in a game this season. Next up, St. Margaret’s will look to keep its winning streak alive against Yorba Linda (5-2) squad on Tuesday. Faith Lutheran continues its five-game road trip with a tilt at Foothill on Saturday at 2:00 pm. The game will be live streamed on MaxLaxOC.com. Could you please correct my son’s name. Should be Stuart Pollard. Not Chris. Fixed. Thanks for the help. It takes a village.